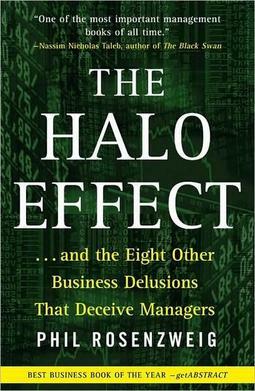 I just read a fantastic book: The Halo Effect by Phil Rosenszweig. This book is all about how popular business books or mainstream business journalism will often analyze successful businesses in a scientific-sounding way (using surveys and metrics and broad-ranging studies of dozens or hundreds of companies) that is ultimately very shallow and prone to confirmation bias. Basically, whenever a company is doing well, its practices will be interpreted as being high-quality. And when it’s doing poorly, those same practices will be interpreted as low-quality. The author gives the example of Cisco. When it was doing well, the company was called “an acquisitions machine” that had turned the art of acquiring other companies into a science. But a few years later, when its stock price dropped, journalists called it a bloated behemoth, which had gone on a spending spree and was now sinking under the weight of too much deadwood. Although the book itself gets a bit repetitious at times, I loved the overall analysis. And I think it has a lot of relevance to the writing field, because if you ever read anything about how to succeed as a writer, one fact leaps out at you: no one studies unsuccessful writers. This was the first thing I noticed when I read Malcolm Gladwell’s Outliers, which contains the famous statistic that master violinists tend to have practiced for more than 10,000 hours in their life. Outliers makes a pretty bold claim, which is that if you practice for ten thousand hours, then you will become a master at whatever it is that you’re trying to do. But it doesn’t ever look at the other side of that: how many people practiced for ten thousand hours and ended up as mediocre performers or outright failures? My guess is that there are more people like this than anyone is comfortable talking about. Similarly, if you’re a successful writer, then whatever you do is used as evidence of your genius. If you lived a wild and eventful life, then you’re a writer who lived his art. If you lived a sedentary and uneventful life, then you’re a writer whose art was enabled by his ordinariness and his sense of discipline. If you write one good book and then a few duds, then you’ve obviously written the only book that was in you. If you write a few duds and then a good book, then you’ve finally found your material. If your later books are less popular than your earlier ones, then it’s because your writing has become a parody of itself. If your later books are more popular than your earlier ones, then it’s because you’ve dumbed yourself down a bit and become more accessible. In all cases, writing is treated like something that you can tinker with. Like how if your golf game isn’t quite where you want it to be then you can go to a golf pro, and they’ll show you what you’re doing wrong and help you rebuild your swing. But golf has very clearly defined goals: get the ball into the hall with as few swings as possible. And it’s subject to physical laws: some ways of swinging the club are objectively better than other ways. Art isn’t like that. Objectives are not clearly defined. And process is totally opaque. Which doesn’t mean that writers don’t worry that they’re ‘doing it wrong,’ and that other writers don’t feel free to chime in with advice. But what it does mean is that no one knows. Really, no one knows. There’s no writerly practice which is so bizarre that some successful writer hasn’t used it. For instance, there’s at least one well-known science fiction writer who doesn’t (and has never) read books! I really hope Rosenzweig uses the term “survivorship bias” because that’s the key error behind nearly all of these bad interpretations. It’s an unfortunate cause of a lot of bad advice that emphasizes things like positive attitude and hard work while glossing over unequal initial distribution of resources. This is definitely going on my pre-order list! He doesn’t use that term, but he does reference that concept. I’m also currently reading Nicholas Nassem Taleb’s book _Fooled By Randomness_ which discusses this stuff in more detail and mostly as it specifically relates the stock market. But Taleb’s book is much more insufferable than Rosenszweig’s (Phil is actually fairly gentle in tone, even though his critiques are devastating).